South Australia’s Goyder Institute for Water Research has developed tools to help planners and policymakers assess the impact of climate change on water resource systems and guide adaption planning. 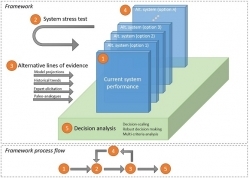 The Climate Resilience Analysis Framework and Tools (CRAFT) project developed a framework to ‘stress test’ complex systems and their response to climate change, created an innovative statistical package to support the framework and applied both tools in practice using a water resource case study. It is anticipated that these tools will be used by science and engineering groups within the state government, water utilities, local government and consulting sector as they plan for future water security. The CRAFT framework, in the form of a short document, helps users to modify a system’s design or operation to improve its resilience to change, identify the ‘triggers’ that limit its resilience in the face of further climate variation and identify when it’s the right time to implement adaptation to the system. It differs from most climate change planning tools as it starts with understanding the system first — how it functions and responds to different stressors — before any climate models are considered. This makes it easier to identify the best course of action for each system under different climate scenarios. For more information visit the Goyder Institute for Water Research website.